With stochastics declining down past the key balance and nearing to the oversold trench, this downward motion may not be over yet. If support can be found at the 6300 range and a reversal to the 26 daily moving average may be a target for a dead cat bounce for higher longs to break even. 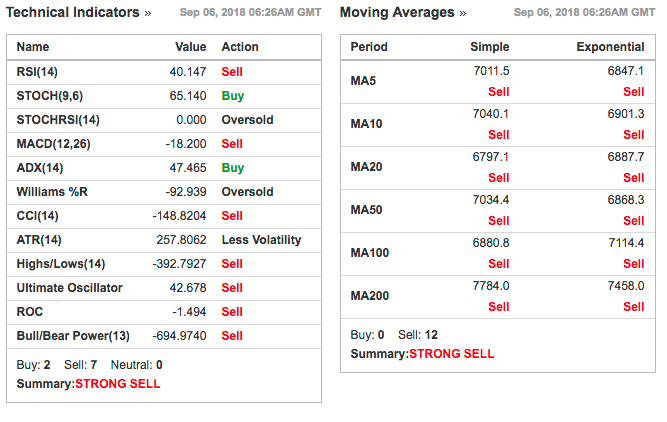 A death cross is next in order, with potential targets being the higher 5000 levels by the end of september, although a contrarian bullish view may see highs of 7000 again if the dollar was to abate. Currently from a technical perspective the situation is bearish and a strong sell, although oversold is showing on Williams and Stoch RSI indicators, we wait for capitulation to complete and some consolidation for signs of a bottom forming.